Uruk, situated in modern-day Iraq, is one of the first cities in the world and was populated almost without interruption for over 5,000 years – from the 4th millennium BCE to the 1st millennium AD. Uruk is famous for the invention of cuneiform writing at the end of the 4th millennium, the so-called “late Uruk period”, during which many distinctive architectural features were invented and developed. By that time, the city already covered an area of 2.5 square kilometres. Today, little is know with certainty about the purpose and function of this early representative architecture, among which the so-called “Stone-Cone Building” (ger. Steinstiftgebäude) is perhaps one of the most puzzling examples. The construction technique utilised on this building is without parallel, neither in Uruk itself nor anywhere else in the world. While all other buildings in the region use mud brick as the primary building material, the walls of the “Stone-Cone Building” are made up of an artificial cement-like material that was applied in many layers. Thousands of carefully formed and perforated slabs of burnt ceramic were placed in-between each layer in order to provide the basis for the outer plastering, while, within the plastering, hundreds of thousands of coloured stone cones were immured in geometric patterns to make up the mosaic decoration of the building. Together with Prof. Dr. Eichmann of the German Archaeological Institute, who has been studying the “Stone-Cone Building” for many years, Artefacts reconstructed the building process on the basis of the archaeological evidence. The results were visualised in an animation showing the building’s entire construction process, from its complex foundation design to reflections about its inner installations. Each step of the building process is shown in detail in order to give an informative overview of the construction of this outstanding building. 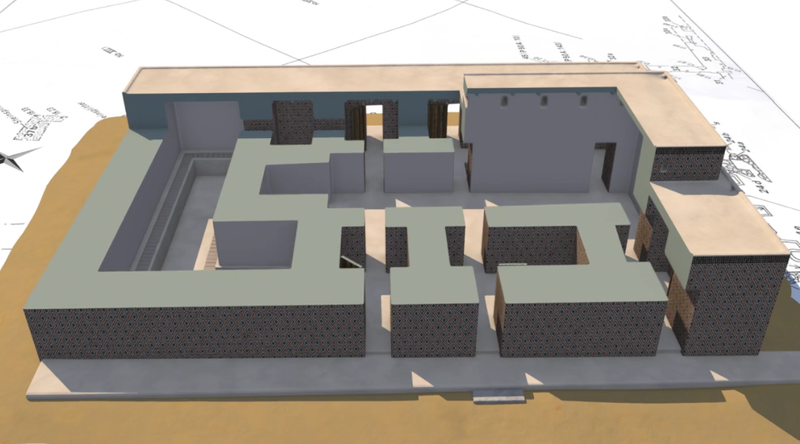 Additionally, Artefacts used the 3D model for calculations on the total amount of building material used in this large-scale building project. The results were impressive, and suggest a high level of organisation behind the construction process. Based on these calculations, the 3D experts created a comprehensive illustration in order to get an idea of the dimensions of this building project.